Detroit Public Schools is undergoing an unprecedented period of transformation that will position DPS as one of the high-quality educational options for families city-wide. 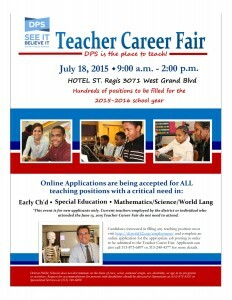 To help recruit talented educators at all grade levels, Detroit Public Schools will host a Teacher Career Fair on July 18, 2015 from 9:00 a.m. – 2:00 p.m. at the Hotel St. Regis, 3071 West Grand. Blvd. 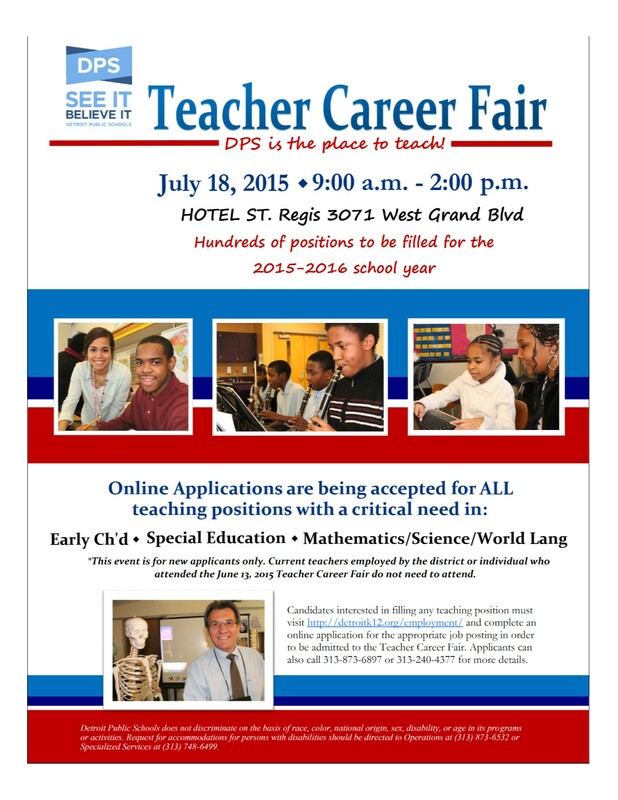 The Teacher Career Fair is being held in preparation for Opening of Schools and aims to fill positions for the upcoming 2015-2016 school year. There are a limited number of opportunities for immediate placement. Interviews will be held on-site and conditional offers provided to qualified candidates. The teaching positions being recruited during this career fair will also build upon the District’s current talent acquisition pool. Washington explains that as a result of retirements, separations and new program offerings, DPS anticipates 200-300 teacher openings for the upcoming 2015-2016 school year. “DPS is excited and views this transformation as an opportunity to continue our mission of ensuring that DPS has the most effective teachers, school leaders, and central office staff supporting every student to achieve success,” said Washington. Applications are being accepted for ALL teaching positions. However, there is a critical need in Early Childhood Education, Special Education, Mathematics, Secondary Science and World Language. Candidates interested in filling any teaching position must visit detroitk12.org/employment/ and complete an online application for the appropriate job posting in order to be admitted to the Teacher Career Fair. Applicants can also call 313-873-6897 or 313-240-4377 for more details.